Below you will find links to company and product information for manufacturers and suppliers in Sweets matching the term Manufacturer-Collier-Metal-Specialties,-Inc.. This page is designed to meet the needs of architects and design professionals who are researching, comparing, selecting and specifying products. Below you will find links to product information for manufacturers and suppliers matching the term Manufacturer-Collier-Metal-Specialties,-Inc.. Each product presentation is designed for the construction industry professional and displayed in a consistent manner. Content categories include: project galleries, specifications, BIM objects, CAD details, 3D Models, product catalogs and green product information. Note to Building Product Manufacturers: Our goal is to include all manufacturers who are providing building product information in Sweets. If your company is missing or you have noticed a mistake in one of the listings, please contact us us today. Sweets is meant to be the most comprehensive and useful tool for finding building products information. Your feedback will help to ensure that design professionals obtain the information they need in the most useful form and help building product manufacturers to improve their content. Description: 14CSB Edging Accessories - Brown Corner Stakes (5/bx) Model: 14CSB Edging Accessories - Brown Corner Stakes (5/bx) Edging Accessories Use accessories to give your edging a professional and finished look. Description: 14SSB Edging Accessories - Brown Splicing Stakes (5/bx) Model: 14SSB Edging Accessories - Brown Splicing Stakes (5/bx) Edging Accessories Use accessories to give your edging a professional and finished look. 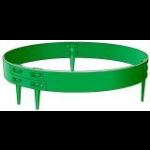 Description: 10ESB Edging Accessories - Brown Edging End Stake Model: 10ESB Edging Accessories - Brown Edging End Stake Edging Accessories Use accessories to give your edging a professional and finished look. 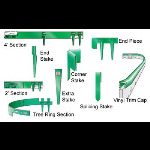 Description: 10XS Edging Accessories - Green Extra Stakes (Barcoded) - 40/bx Model: 10XS Edging Accessories - Green Extra Stakes (Barcoded) - 40/bx Edging Accessories Use accessories to give your edging a professional and finished look. Description: 75FP - 7"x5" Face Plate Model: 75FP - 7"x5" Face Plate Galvanized Face Plates Mount face plates directly to any flat surface using the holes provided. You can mount the faceplates for either horizontal or vertical plant bench cards. 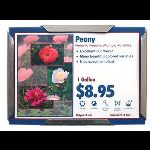 Description: 1159TT - 11.5" x 9" Tabletop Signholder Model: 1159TT - 11.5" x 9" Tabletop Signholder Table Top Sign Holders Can be used for both indoor and outdoor displays. Galvanized or durable powder coat finish available in attractive colors. Description: 57TT - 5" x 7" Tabletop Signholder Model: 57TT - 5" x 7" Tabletop Signholder Table Top Sign Holders Can be used for both indoor and outdoor displays. Galvanized or durable powder coat finish available in attractive colors. 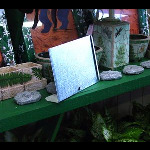 Description: 117FP - 11"x7" Face Plate Model: 117FP - 11"x7" Face Plate Galvanized Face Plates Mount face plates directly to any flat surface using the holes provided. You can mount the faceplates for either horizontal or vertical plant bench cards. Description: 45TT - 4" x 5" Tabletop Signholder Model: 45TT - 4" x 5" Tabletop Signholder Table Top Sign Holders Can be used for both indoor and outdoor displays. Galvanized or durable powder coat finish available in attractive colors. Description: 75TT - 7" x 5" Tabletop Signholder Model: 75TT - 7" x 5" Tabletop Signholder Table Top Sign Holders Can be used for both indoor and outdoor displays. Galvanized or durable powder coat finish available in attractive colors. 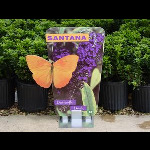 Description: 16PH - 16ga Poster Holder Model: 16PH - 16ga Poster holder Poster Holder Hold popular coroplast and corrugated poster displays up to 4' wide x 4' tall. Description: 9115TT - 9" x 11.5" Tabletop Signholder Model: 9115TT - 9" x 11.5" Tabletop Signholder Table Top Sign Holders Can be used for both indoor and outdoor displays. Galvanized or durable powder coat finish available in attractive colors.